Huse Engineering is an innovative company with a strong focus on providing the best lifting and handling solutions for the marine and offshore industries. Our products are developed in close co-operation with Rolls-Royce Marine. We carry out concept evaluation and development, engineering design, fabrication and assembly, installation and commissioning. Huse Engineering is a fully owned company of I. P. Huse – a world leading manufacturer of winches for anchor handling vessels (AHTS). We are 47 highly qualified employees who are ready to offer you the best service. Our head office is located in Molde, four kilometres west of Molde Airport and 97km from Ålesund Airport. The AH-cranes are moveable and flexible shipboard cranes, which help in reducing hazardous deck operations. More than 140 units have been delivered since 2006. An extensive reference list can be given upon request. • Equipped with various tools for deck operations, e.g. chain claw, wire twist reducer, heavy-lift, pennant catcher, etc. Moveable crane based on the same interface (rail) as AH-cranes. 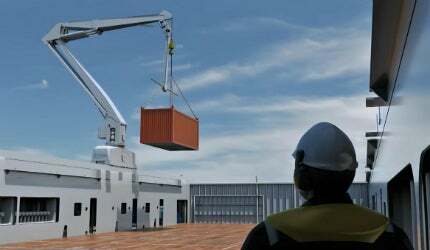 The cranes are optimised for cargo handling, i.e. containers, baskets, pipes, etc. Complimentary deck tools are provided as options. The new DDC (dual draglink crane) concept provides a significant increase in operational capabilities. Due to the crane’s geometrical and structural properties, the DDC system gives several advantages compared to traditional cranes; increased maximum SWL working area, increased lifting range and height, lower weight and CoG and optimised horizontal load handling. Special DDC for the handling of subsea modules and other equipment on offshore vessels. Capacity 20T to 150T SWL. The crane is equipped with an active heave compensating system (AHC). This can either be a winch (rotational) based system or a crane jib (linear) compensating system. The crane jib AHC system has the following advantages; reduced heat generation and friction on wire, reduced bending cycles and overall fatigue for wire ropes. In combination with fibre rope, this will provide a favourable solution with respect to fatigue.